My record of my August 2017 Midlands rail adventure continues (you can catch up on the previous instalment, “Moor, Please”, here). With the weekend over, the focus returned to the modern railway. The morning of Monday 14th August saw us take the 09:48 from Leicester to Nottingham on ‘Meridian’ unit number 222015. There we changed on the ‘Robin Hood Line’ to Worksop, a route that closed to passengers in the 1960s. This fact we found rather surprising since one of the places served, Mansfield, is a rather large town. 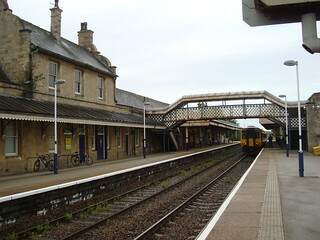 According to Wikipedia it was then probably the largest town in Britain without a station, but now has two. Both Mansfield (town) station and Mansfield Woodhouse also seem to have retained their original station buildings, at least in part, although the structure at the latter is rather odd. It looks more like an engine shed than a station building, apparently having no indoor ticket office or waiting room area. I wonder if it really is a survivor of the original railway or an unusually well-designed modern replacement dating from the line’s phased reopening in the 1990s. The service we used was the 10:26 from Nottingham, with 156411 in charge. Despite the line’s marketing name recalling the legends of Sherwood Forest, the trees we saw (which were rather more plentiful than expected from a look at the route on Google Earth) did not appear to belong to any form of ancient woodland. I don’t suppose much true ancient woodland still exists in the area. Robin Hood Terminus: ‘our’ class 156 stands at Worksop waiting to return to Nottingham. The ‘Robin Hood Line’ was a bit of a detour on-route to the main objective of the day, to take a photograph of a class 399 unit and investigate the route they will be used on. The class 399s are tram-train units for the ‘Sheffield Supertram’ system and were due to be added to the Supertram fleet later in 2017. Thus, after arrival at Worksop we turned west, boarding the next Sheffield-bound service. This route is operated by Northern, rather than East Midlands Trains, and I wondered what rolling stock they would use on it. The answer, it turned out, was Pacers. Ours was 142028, due off Worksop at 12:15 and bound for Adwick (reversing at Sheffield). The unit was still fitted with bench seats similar to those in old buses but in 2+3 configuration (wider benches on one side of the aisle). Not far out of Worksop, and if I recall correctly also visible from the Robin Hood Line, was a large quantity of wagons. These I believe were large coal hoppers and I surmised that they were redundant following the decline in coal traffic. My grandmother suggested that somebody should try to find a way of reusing them. I think some redundant coal hoppers have been modified with the addition of covers to allow the transport of biomass for burning in power stations, but since we were travelling on a Pacer and these large coal hoppers have bogies my idea was to use the under-frames to create ‘Bogie Pacers’. The Pacers are near life-expired anyway though and the chances of the vehicle lengths being the same are quite slim, so I doubt that is a sensible idea. While the class 399s will initially just be working ordinary tram services on the current Supertram network, the reason for their existence is a plan to extend Supertram services over Network Rail tracks through Rotherham Central station. Ordinary trams are not permitted to share tracks with conventional heavy-rail trains, hence the class 399 ‘tram-trains’ which can mix with both. On the approach to Sheffield, our Pacer passed the Supertram depot where, to my dismay, I counted at least five class 399s. Knowing the total fleet was only 6-8 units (having now checked Wikipedia, I see the planned fleet size is 7 units) I feared none might be in use that day. Sticking to the plan, we stayed on the Pacer while it reversed in Sheffield station and headed out, through Rotherham Central, to Swinton. 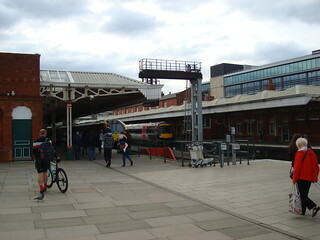 Here we left the train, it having rejoined the Sheffield – Doncaster route (Rotherham Central is on a separate short line). We then headed back into Sheffield, boarding the slightly delayed 13:19 service. This was bound for Lincoln and, according to Real Time Trains, had come from Scunthorpe. Scunthorpe to Lincoln via Sheffield; a strange route and a long way to go on a Pacer. Our unit was another bench-seated one, 142023. At Rotherham Central, where I had noted on the way up that works to build the low platforms for the class 399s had apparently barely started, I wondered how they would get the Overhead Line Equipment (OHLE) to power the trams through the station. It looked as though the station had recently been rebuilt without consideration of tram-train scheme, although Wikipedia tells me the current buildings date from February 2012 as a result of a project started in 2010 (so perhaps before the tram-train plan). Outside the station, a number of the masts to support the overhead line were in place on the section to be used for the tram-train service, but no wires as yet. 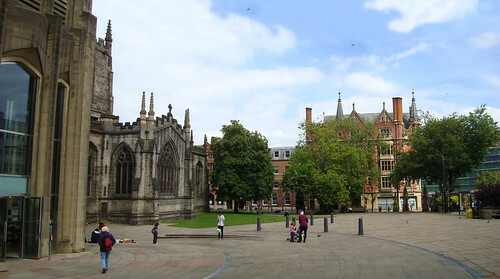 Cathedral Square: public open space outside Sheffield cathedral, part of which is visible on the left. Back at Sheffield station, the dilemma of how to find and photograph a class 399 came to the fore. Having possibly seen the entire fleet in the depot my first thought was to try and get there, but down which of the tram routes that converge on the city centre was it? And would it be too far to walk? We started following one line in the direction we had come on the train until we came to the junction where the lines meet. 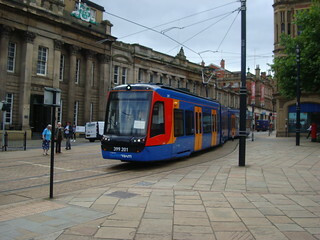 Spotting Success: tram-train 399201 appears, approaching the Cathedral tram stop in Sheffield city centre. At this point I decided that even if we could reach the depot the fencing around it might prevent photography. We therefore reverted to my original plan to walk alongside the tram line to the cathedral, following a section that all the routes use according to the network map I’d found online. If a class 399 was in service, it would have to pass us. I spotted a poster on one of the tram stops that explained that class 399s weren’t yet in service, but might be in use for driving training. We waited outside the cathedral for a while and thankfully it turned out one was out and about. Photos taken: mission accomplished. 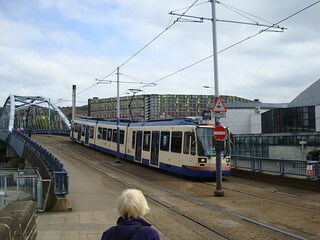 Standout Supertram: a Sheffield tram in blue & cream livery heads into the city centre. On our way to the cathedral, I had decided that all the trams carried the same livery of Stagecoach blue, with the class 399s having black fronts and the other trams a red front. By the time we had finished at the cathedral and walked back to the station however, we had seen at least one with a blue front and one in an interesting blue and cream livery. 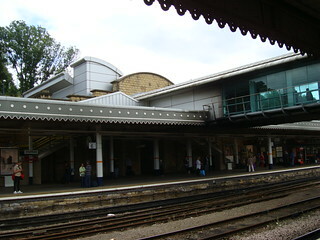 Sheffield station retains well-designed ‘railway age’ buildings and canopies, the latter being an interesting grey colour. Grey, interesting? In this case yes, because it results in a steel-like finish that is rather fitting given Sheffield’s history. 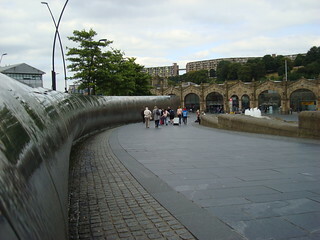 That history is also reflected in one of the water features just outside the station. I had a number of options for routes back to Nottingham and thence to Leicester. In the end, after grabbing some footage for a short video about electrification cancellations, the one chosen was the 16:05 to Nottingham via Chesterfield. 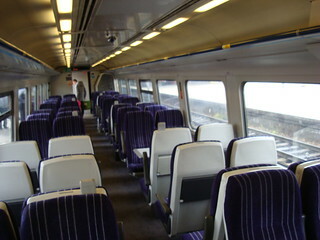 Northern provided a very different standard of train for this run. Almost making up for the earlier Pacers, 158794 turned up with some really nice seats and the Regional Railways original two-tone blue stripes on the luggage racks. The only issue with the interior was the legroom in the airline-style seats; not quite enough for comfort on a long journey (not that ours was particularly long on this occasion). 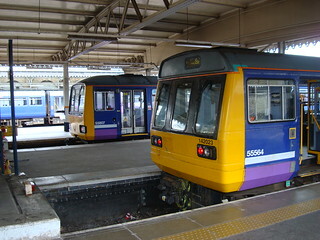 Investment (in electrification) Required: Nottingham station with two diesel multiple units present (an XC Turbostar and an EMT Meridian unit, probably the one named ‘Invest In Nottingham’. Nottingham, along with Sheffield and Swansea, has recently suffered the indignity of having its promised electrification cancelled. With footage of Sheffield in the camera and Swansea, as railways go, practically on my doorstep Nottingham was the obvious next target. I might have left it a day or two and made a special trip up to Nottingham later in the holiday, but fate intervened. As I walked along the platforms, I noticed that the class 222 due to depart in a few minutes was named ‘Invest In Nottingham’. You couldn’t have made it up; it seemed it was just meant to be, so I filmed its departure. That did mean a wait of nearly half an hour for the next London-bound service, the 17:32, but since that train was already in the platform I wasn’t bothered. Taking the 17:32 also meant I got my first ride on an East Midlands Trains IC125 set. 43044 led us to Leicester with 43066 on the rear. The seats were the original British Rail ones with the slightly awkward fixed armrests. That wasn’t the only shortcoming either; assuming the interior layout is unchanged I’m not entirely impressed with BR’s efforts. 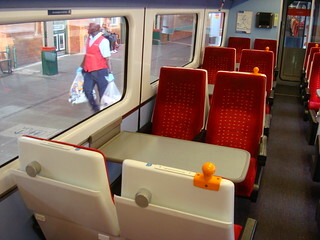 Despite the mark 3 coaches having reasonably large windows, some of the table bays managed to offer an obstructed view to half their occupants. 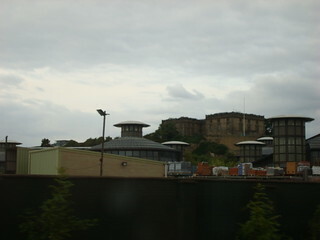 Nottingham Skyline: the large building on the hill-top, seen through the train window. The seats themselves were a reasonable shape (the armrest problem aside) and the seat-base cushions were ok, but the seat-back was hard. Unlike on the Great Western, where first class has been reduced to 1.5 coaches out of 8 the EMT sets seem to have 2.5 coaches of first class. As we left Nottingham, I managed a slightly blurry photo of an unidentified large building on a hill top that had caught my eye previously.